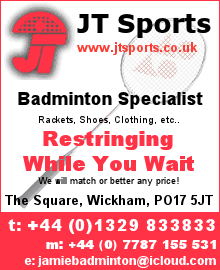 Welcome to the Winchester & District Badminton Association website. Please select an option from the menu. The Ladies and Mens Handicapped Doubles Tournaments are being held on Sunday 19th May at The Westgate Centre, Winchester commencing at 2pm. Entries are to be in by 1st May. Go to the Download Page for a Tournament Entry.. More.. The Basingstoke Open tournament is on Sunday 24th March at Queen Mary's College, starting at 11am for the levels (Ladies and Mens) and 1:30 for 2pm for the Mixed. The Basingstoke Open Tournament is open to any.. More.. The Renton Cup was won by Jonny Ritter & Hannah Weitz (Soton Uni Colours) with the Runners-Up Richard Grainger & Rebecca Heaton (Soton Uni Colours). Go to the Download Page for a Report of the Tournament. More.. The 2018/19 League Structure and Banerjee Cup Draw can now be found on the Downloads page. Please be aware that last minute changes to the League Structure have been known in the past so any Fixtures made prior to the AGM.. More..